And when it comes to adults, Jesus generally showed no signs of caring how they come to believe in him. Jesus said, “whoever believes in me has eternal life,” not “whoever believes what reason and evidence support has eternal life,” or “whoever rationally judges that I’m God has eternal life.” (John 6:47) Sheer belief is what’s important for faith and salvation, not thinking or reasoning about evidence. The Biblical Apostle Paul denigrated and virtually dismissed human knowledge and wisdom in relation to God: “For the wisdom of this world is foolishness in God’s sight. As it is written: ‘He catches the wise in their craftiness'” (1 Cor. 3:19) and “[T]he foolishness of God is wiser than human wisdom, and the weakness of God is stronger than human strength.” (1 Cor. 1:25) Here again, we are expected to simply believe, rather than to rely on our “human wisdom” and reasoning. Even today, most religious people, when they are concerned with the religious beliefs of others, are not concerned about the thinking methods of those others, nor about the consistency of their beliefs with the evidence in reality. Rather, they are concerned that those others’ beliefs do not match their own beliefs, and so do not match “the truth.” The only “evidence” many religious people are concerned with in religious doctrines is “scriptural evidence.” How does the Christian know that Jesus was Lord? That’s what the Bible says. How does the Muslim know that there is no god but Allah, and Muhammad is his prophet? That’s what the Qur’an says. So there are plenty of instances where people believe in things without significant evidence, or against the evidence, and the proper term for this sort of belief is “faith.” This is the “child-like” religious belief that Jesus extolled in the Bible, the intellectual humility that Paul admonished Christians to have, the belief before understanding that Augustine thought necessary, and the type of belief inculcated by the First Pillar of Islam. Unlike the distinctive and proper meaning of faith shown in the previous section, trust in another person is generally (and properly) considered conditional upon that person’s character, actions, honesty, and various other factors. Trust can be earned or lost based on what a person says or does. It would be irrational and self-destructive to take everything everyone says about the world as a fact, without scrutiny. (Imagine acting on every rumor, superstition, or conspiracy theory you read or hear, without question, until you happen to read or hear something to the contrary.) On the other hand, it would be tremendously limiting and would stifle one’s intellectual development to immediately dismiss everything other people say as irrelevant to facts. (You could never be taught physical science by anyone else unless they performed every relevant experiment in front of you, or world geography, unless they took you on flights covering the globe.) Evidential trust is warranted in certain circumstances, in regard to certain people, and not warranted in regard to others. When to extend evidential trust to someone is properly based on evidence about them and about the world that you have observed first-hand. You can trust evidence provided by other people when it fits solidly into the “structure of knowledge” in your mind. This “structure of knowledge” is a whole network of interrelated and mutually consistent concepts, theories and conclusions about the world, ultimately built from first-hand observations of the world. The second element in the structure is the meaning of “die.” When animals die, they stop moving, eating and pooping permanently, and their bodies decompose. One of the observations that provide the fundamental basis of the concept of death is your observation of certain animals that stop moving and stop taking any of their characteristic actions. They just sit there, start to decompose, break apart, and often smell really bad. 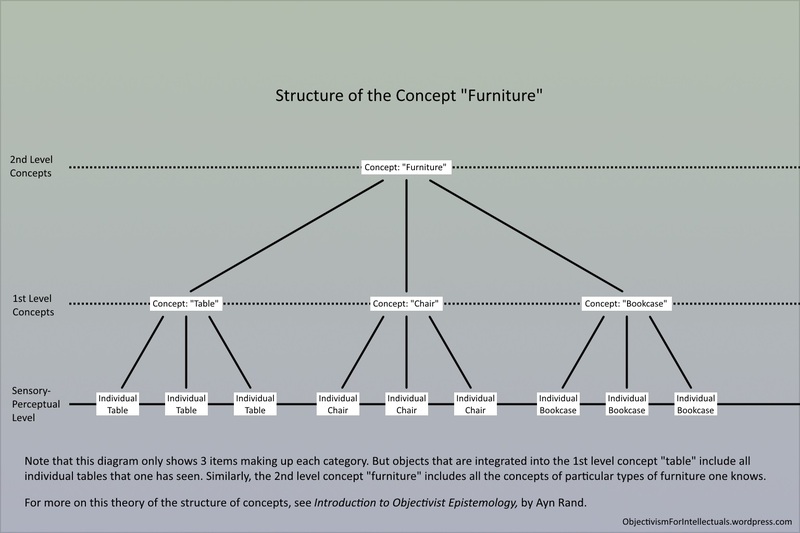 An example of structure in human knowledge: The concept “furniture” is built up from a person’s sensory perception of individual objects. Click to enlarge. You also know from firsthand experience that people can leave your field of vision and come back later. They come back with the same memories they had when they left, plus some additional information from their time away. So it’s clear they didn’t just vanish and reappear, but continued to exist while you weren’t observing them. So you know that, at any given time, there are a lot of people that exist that you’re not directly perceiving. Also, because other people resemble you in many respects: because they have senses with similar capabilities and limitations to yours; they have to learn things from personal experience or the instruction of others; they can make errors in judgment; because they have to learn things in much the same order you do (arithmetic before calculus), you can understand that other people have a structure of knowledge much like yours. So you can know from firsthand observation that other people can report facts accurately from their observations and draw conclusions properly from the evidence they have, or they can be mistaken in the conclusions they draw from their observations. You also know that people can be accurate about what they have directly observed, or they can lie about their observations, distort them by omitting certain details, or they can misremember their observations. In determining whether you can trust someone’s account of the facts, you are trying to determine what caused him to tell you what he did: Was it that the facts match what he is saying, or was it some extraneous factor that motivated him to lie or distort, or was there something that caused him to misremember? There are numerous ways to test this and the results of these tests can count as reasons to trust the person or not trust him. The most obvious test of a person’s trustworthiness is your prior experience with him as a source of facts: has he been a consistently accurate source to the best of your knowledge in the past, or has he lied, distorted or misremembered? (And, especially in the case of someone who has misremembered in the past, a relevant factor is how long ago the claimed event took place.) Past lies are an obvious and major strike against a person’s trustworthiness. Another major factor in favor of trust is if you can corroborate some portion of what the person is telling you with other evidence. The best kind of corroboration is firsthand physical evidence, where there is no question as to the trustworthiness of the corroboration itself. But corroboration from other, independent human sources is helpful as well, since it tends to increase the likelihood that the cause of the reports is the messengers’ recognition of facts, rather than some error or other agenda. Another test is whether the messenger shows a strong concern for facts in general, or shows little regard for facts. Does he eagerly cite his sources for facts, or does he seem to expect you to take his word for what he says? Is he generally concerned with staying true to facts, or does he frequently take things on faith? Showing concern for facts is an indication of trustworthiness, whereas reliance on faith or emotional attachment to ideas is a count against it. If someone explicitly asks you to take a certain claim on faith, then that person is effectively telling you not to trust him on that claim: He is telling you that he does not have a good basis in evidence for what he’s claiming, so trust in him would not be reasonable. The last test I’ll discuss here is the integration test. Is what the person telling you consistent with the knowledge you have gained from firsthand experience? Or, in other words, can the claim be integrated into your basic structure of knowledge? If a witness in a trial told you that he saw the accused man walk on deep water with no aid, or turn water to wine with the wave of his hand, or jump to the moon and back, the integration test would indicate that he’s mistaken, lying, or insane, and can’t be trusted in this instance. Everything you know about human beings shows that they can’t do these things. If you apply these tests and abide by the results, then the acceptance of what others say can be a rational, observation-based practice. If you don’t apply the tests, then acceptance of what others say becomes faith on your part. Trust accords with first-hand evidence and is part of a rational approach to the world. Faith defies first-hand evidence and is irrational. Scientists rely on papers published by other scientists, and they don’t themselves redo every experiment of other scientists. So the collaborative (and competitive) scientific process, as it exists today, relies on trust. Scientists trust that the experiments described in the papers they read were actually done, and that the results were as they were claimed. But as a general rule, scientists do not take others’ results on faith. The modern scientific establishment has a system in place to carefully vet papers: peer review. Peer review is a process where experts in the relevant field carefully examine a submitted paper for errors, inconsistencies, and places where the data do not support a conclusion. Now peer review doesn’t completely guarantee that the claimed results are legitimate. Some people have successfully had bogus or fraudulent results published in journals. But part of what leads to the general acceptance of experimental results by scientists is the ability of other scientists to reproduce those results. A scientist who is especially concerned with the scientific legitimacy of a certain result may attempt to repeat the experiment and check the results. Or, he may choose to look for instances where other scientists have replicated the results, or used them profitably in their own research. The main point here is that scientists are generally very concerned about the basis of scientific claims in observation. They generally are guided by the tests for trustworthiness that I described in the above section. If a particular paper contains an experiment whose results cannot be reproduced when someone attempts it, (rigorously and carefully) then the paper is considered suspect. If it is found that a scientist has falsified data, then that scientist is discredited and no longer trusted as a reliable source. If a theory is inconsistent with careful and repeated experimental observations, then the theory must be modified, discarded, or considered a mere approximation to the truth in certain conditions. Scientific trust in others is very much conditional on the evidence of their trustworthiness. Religion, on the other hand, does not promote this observation-based, conditional trust. Religion encourages acceptance of what others–or a holy book–say, based on your feelings and the sheer fact that it was said by the source. This is the essence and one of the defining features of religion. However much people seem to think or reason about their religion, the fact that it is a religion means that there is some premise it relies on that is not supported by the evidence the person has. That is, there is some point that is accepted based on sheer emotional feelings, without rational consideration. For Jews, this is generally the existence of God and the divine origin of the Ten Commandments; for mainstream Christians, this generally includes the divinity and resurrection of Jesus; for Mormons, this further includes the prophethood of Joseph Smith; for Muslims, this is the existence of the (non-trinitarian) Allah and the prophethood of Muhammad; for Hindus, this is the existence of Brahman and the divine authority of the Vedas. As I have shown, faith and trust are very different. Faith is the acceptance of other people’s claims on the basis of sheer emotion, without any genuine attempt to rationally check those claims. There are many different and conflicting religions in the world, and a person accepting one religion on the basis of faith has no more claim to truth than another with a different religion. Evidential trust, on the other hand, is a part of the process of reasoning from evidence. Trust relies on a rational, evidence-based evaluation of the trustworthiness of other people. Those who fail the proper tests for trustworthiness are not to be trusted by a rational person. Modern science often relies on trust to some extent, but it need never rely on faith. There was also the 2nd-Century church father, Tertullian, who wrote in De Carne Christi, “The Son of God was crucified: there is no shame, because it is shameful. And, buried, He rose again: it is certain, because impossible.” As you can see, he regarded Christianity’s violation of reason as a major mark in its favor. It was not until St. Thomas Aquinas (b. 1225) integrated Aristotle’s worldly, non-Christian philosophy with his influential theology that the Catholic Church started to put reason on a roughly equal footing with faith. With Aquinas, reason was given it’s secular sphere of dominance, and arguments for the existence of God allegedly proceeding from observations of the world/nature (natural theology) started to be seen as somewhat important to the justification of the Church’s doctrines. (2) See also this YouTube video: Thinking Objectively. This entry was posted in Epistemology, Religion and tagged atheism, Ayn Rand, Christian, Christianity, faith, Islam, Objectivism, philosophy, science, trust by Sword of Apollo. Bookmark the permalink. I suggest that you read the work of Robert Green Ingersoll (1833-1899), known as the Great Agnostic and the greatest orator in US history, whom so many who knew him considered as perfect a moral character as man could ever be – a 19th century John Galt with a warm heart and sense of humor. He covered this territory more extensively before you and before Rand.